Internet giant Google has unveiled a new feature inside its Google Earth software: Google Sky. 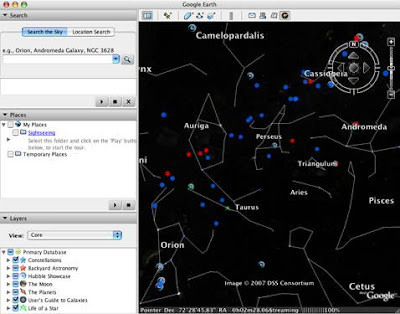 Google Sky allows each user to scan the skies, giving information on all the bodies in our sky, stars, planets etc. The new feature includes images from The Hubble Space Telescope and allows the user to take a virtual tour of the Milky Way and other galaxies. Google's Lior Ron said: "... we've been able to transform Google Earth into a virtual telescope." Dr Carol Christian from the Space Telescope Science Institute said: "Sky in Google Earth will foster and initiate new understanding of the universe by bringing it to everyone's home computer."